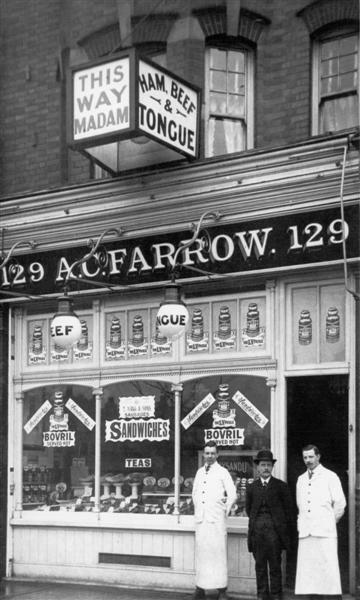 The photos below are just some of the shops that have lined the High Road in the past. 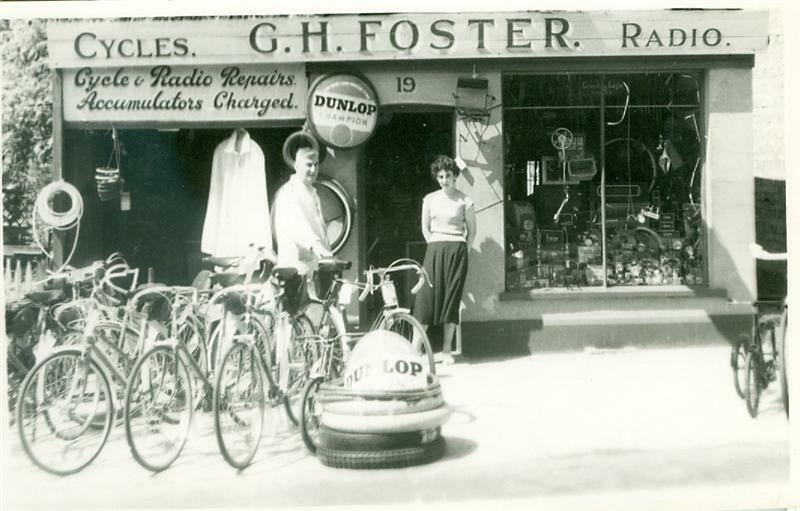 G. H Foster, 115 - 117 High Road. 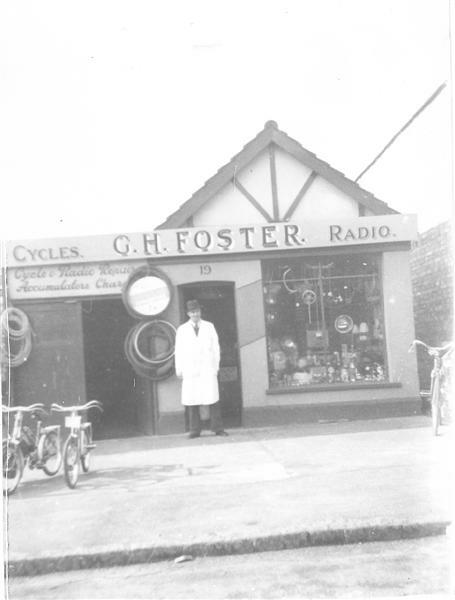 Mr George Foster stands in front of his shop (now demolished). Elora Chemist occupies this position today. The number 19 on the shop facade is misleading and may refer to when the High Road was the London Road. The shop that was Foley’s is now Cafe Max. I took some ‘old Benfleet’ friends in there for a meal recently and Stephen even remembered the slight change in floor level on the way to the back of the shop! How these memories stick in the mind! Yes, Foleys was definitely the best shop in town! Remember the Dinky toy cars in their boxes – wish I’d managed to keep them. Was Foley’s owner Mr Farranti? In the time when I went to Foley’s Mr and Mrs Farrant ran it and lived upstairs. I did not know of the possible connection with the Just William stories – it was Foley’s and that was it. Now there’s a separate door that encloses the stairs to what was the flat above the shop and I seem to recollect a side gate on the left hand side which led to the garden. I am not sure when the Farrants ceased trading but John Lonsdale ran a Stationers’ business there subsequently. I have photograph of the parade of shops showing him there in 1994. Foley’s was a wonderful shop, I would visit most Saturdays to spend my 2/- pocket money on a matchbox car or one of the basic Airfix kits that were hung about the shop. The owner was, I believe, Mr Howard Farrant and I have always believed, although it has never been confirmed, that it was named “Foley’s” after the name of the toy shop in Richmal Crompton’s ”Just William” stories. Mr Pickett what a great man always had time to chat. Remember going in there with my mum and dad to get a new tyre for my chopper and coming out with a sun snipe racer, Good old days. The new shop on the site of The City Stores, 211 High Road, which was unoccupied when the piece was published, is now Williams and Donovan, Estate Agents. The memories of Foleys and Meccano reminds me that he also sold Bayko Building sets. I still have many of the building bricks, roofs and accessories which the grandchildren have out from time to time. Looking back these were probably my first adventures into the building industry which, in one form or another, have been part of my professional life. 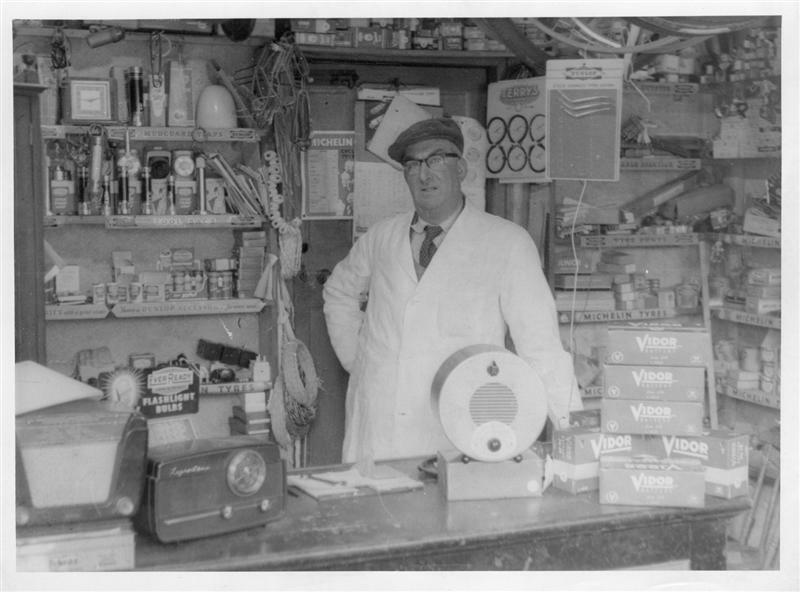 I remember Foleys the toy shop and the “Arkwright” dressed Mr Foley. I remember buying many toy models there including a vast collection of Meccano parts of which he meticulously crossed off any part he sold in a little black book. 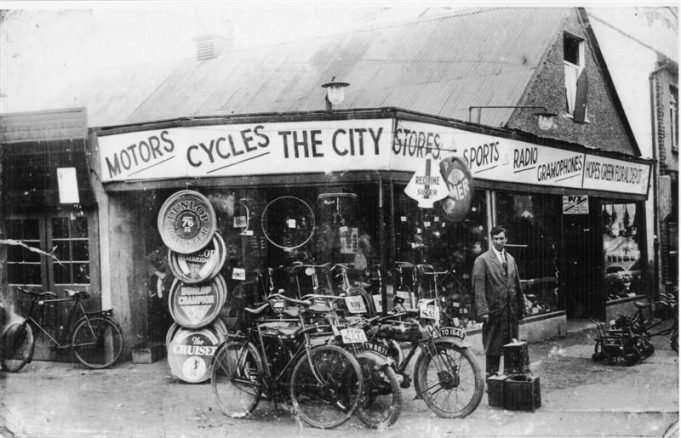 I too remember looking in Pickets window at the Claud Butler bikes and frames, if I recall he built them to order from all the parts available in his stocks. Another shop well remembered was Paul Hansons DIY emporium on the hill opposite St Mary’s church, what a shop I used to spend hours in there! I can certainly remember Picketts in the 70s. We would stand outside and look at the Claud Butler bike frames we might one day be able to afford. Mr Pickett would also buy old golf balls we might “happen across” on our way over the golf course to get to the High Road! I wonder if anyone remembers Foleys the toy shop a few shops along to the left of Picketts. He used to sell Airfix and model cars. An elderly gentleman with half moon specs and white hair. He always wore a brown coat like Arkwright as he was always making models when we went in. When he retired the shop closed and Picketts took on the Airfix stuff as I remember. I can also remember V & A Barnes who did sporting goods and if you caught him in a good mood would sell us air gun pellets for our air rifles. “so long as you don’t say you got them here!“, happy days!. 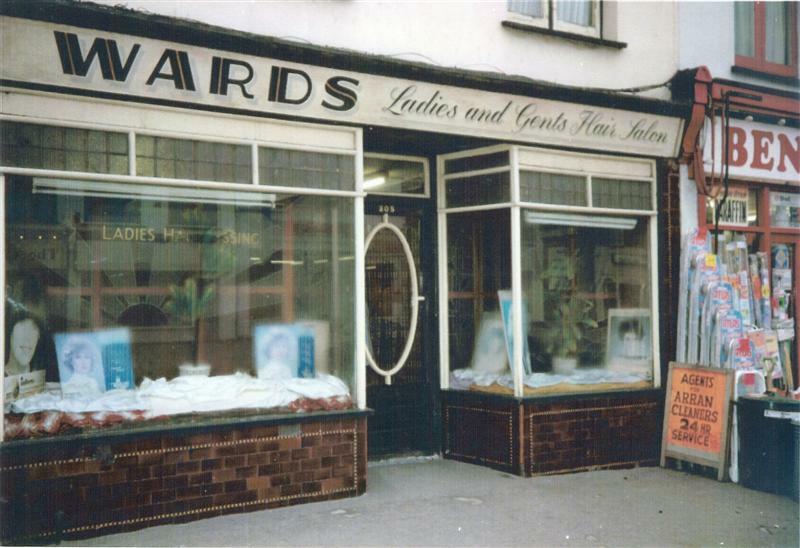 Does anyone remember a laundry run by a Mrs Daniels in the 30’s and 40’s, situated behind the shops at Hopes Green? She lived along Richmond Avenue and had four children, Ronnie, Iris, Emil (Frank) and Leslie. I remember Fosters in the sixties and then Picketts when Ralph took over. I used to buy pieces of wire and bulbs to play around with electricity when I was in primary school. Progressed to buying racing cycles from him in my teenage years. Fond memories of a kind and generous man. 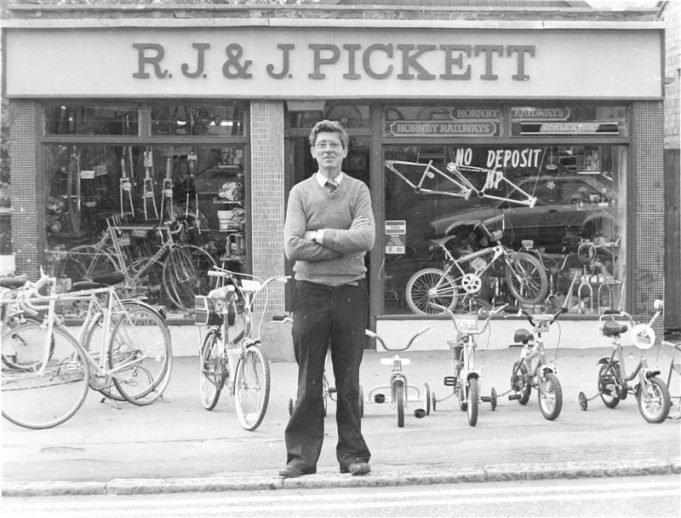 If you grew up in Benfleet in the 70s/80s then Pickett’s was a shop you always visited, to either look at the latest bikes, buy fireworks or just pop in for a chat!….proper ”old school” shop keeper! I remember spending a lot of my pocket money at Mr Pickett’s shop, not only did he sell bikes he also stocked Airfix models and Action Man. Looks like a Raleigh Grifter in the window so I would guess about 1980 give or take a couple of years.